Some years ago I was given some pieces of bog oak, roughly 1″ x 1″ x 4″. I painted the ends with PVA glue and placed them in the eaves of my shed and forgot about them for some time. Enough time for them to dry out and any splitting to have occurred. Well I’d been looking at making a corner chair for some time to add to my “cube” and this bog oak would make it something special. The basic frame is very simple and at this scale it is difficult to make proper joints, I tend to make simple joints just to allow for easier assembly. The back is made from three pieces of bog oak that were steamed and laminated around a large round mandrel and then left to dry. These steamed pieces were then glued together using PVA glue and again formed around the mandrel and left to set. Once the laminations had set they were carved into the shape of the back. It took me some time to work out how to make the seat. In the end I decided on bamboo. Slivers of bamboo were planed from a garden cane and then split into pieces roughly 2mm wide. 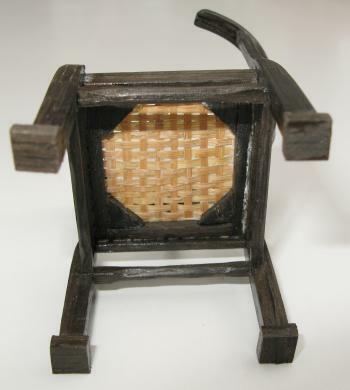 These were then woven – this took some time using a loom made for the job. I kept wetting the bamboo to keep it pliable. 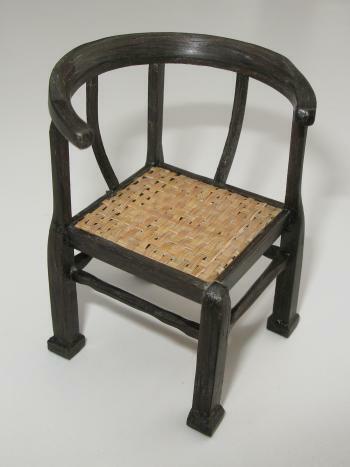 The result is a 1/12th scale chair that is made from bog oak – maybe a thousand or more years old. 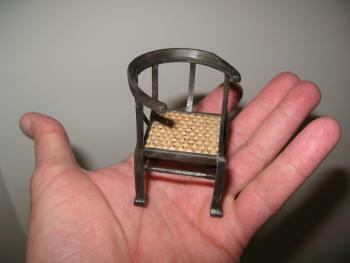 The actual size of the chair is clear when held in a hand!. I make a lot of miniature engines and this is a nice change, a different set of materials and skills are needed and that keeps the mind active – see my gallery here.